A special thanks to Terry Lane over at Buzzin' Golf, a top notch golf-related site and blog across the pond. 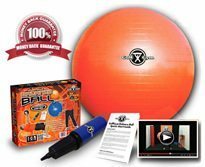 The Buzzin' Golf folk requested some GolfGym products a few weeks back and they'll be reviewing it on their site over the next month. "Over the past year three PGA Professionals have analysed my golf swing and given me the same critique. The backswing is, apparently, pretty good. But like many amateur golfers I have a tendency not to follow right through the ball in a straight swing; and as a result if I’m not careful, my driver shots can be affected by a fade. Attempting to train myself to swing true, I was told to place two clubs together and swing them several times. It sounds simple but works. The weight of the clubs helps to keep my forward swing inline and complete. The problem with placing two clubs together is you cannot hold the clubs with a proper grip. I thanked the Pro who recommended this to me last year and was surprised that, as far as he was aware, a manufacturer hadn’t produced a heavy club, as he said this was a tried and tested technique. 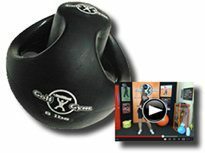 Well now GolfGym, a golf fitness company based in California, have produced a weighted club, and it works a treat! The GolfGym Weighted Training Club comes in two weights: Club 38 weighs 38oz. (2.4 lbs) and Club 28 weighs 28oz. (1.75 lbs). 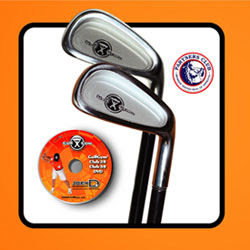 The GolfGym Weighted Training Club design distributes the weight to perfectly match a standard golf club, with half the total weight in the bottom third of the club. The added weight increases flexibility and balance; and the weight of the club forces you to keep on the correct swing plane. 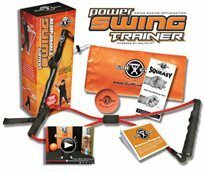 In much the same way as the excellent Explainar golf training aid forces you to follow the correct swing plane through a heavy weight system, the GolfGym Weighted Training Club works perfectly for me. The only difference is the weighted club is portable and fits in my golf bag. The Explainar is big, expensive and even though I could buy a portable version to fit in the boot of my car, it’s hardly practical to use as part of my warm up on the first tee! The GolfGym Weighted Training Club comes with a left or right hand grip that forces your grip, which I’m not overly keen on to be honest. But that aside, I really can’t praise this golf training aid enough. 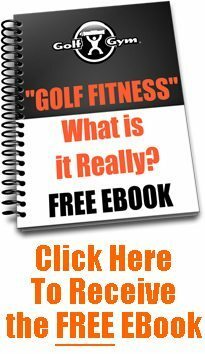 It includes a training DVD showing exercises well respected biomechanics golf coach Joey D employs with the six PGA Tour Pros he is currently working with. 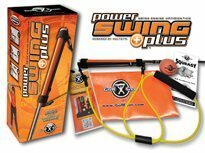 The Weighted Training Club is part of a complete range of golf training aids from GolfGym and PGA Tour Coach, Joey D. GolfGym has just announced that the Joey D Signature Series is now being shipped globally."